This material is very soft therefore excellently suited to conform to irregular surfaces. In addition, this material exhibits high compressibility and natural adhesiveness. It is excellent for applications where high electrical insulation is needed. 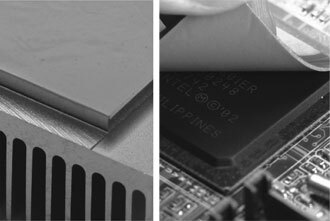 This product has high thermal conductivity to effectively conduct heat away from sensitive components to a heat sink. The 6003 is an excellent mid-level thermal conductive interface material. The 6003 material provides low thermal impedance; with increasing pressure, thermal impedance becomes lower. 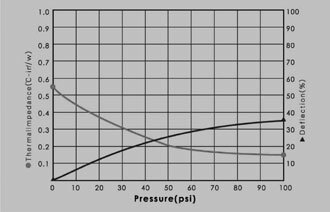 The 6003 material exhibits high deflection (softness); as pressure increases the deflection percentage increases. This material provides good compliance to mating surfaces.